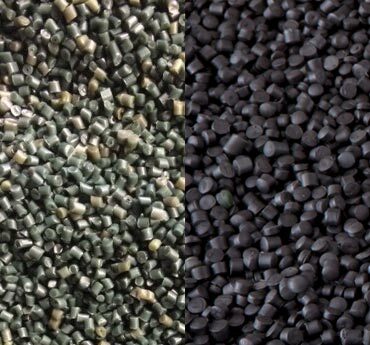 Our goal is to consistently produce the cleanest, highest quality, unfilled nylon reprocessed pellets on the market. So, we buy only the cleanest raw materials from fiber producers, yarn manufacturers and carpet mills. Before processing, these raw materials are thoroughly checked and identified to ensure they meet our exacting standards. Nylon polymer reprocessed pellets can be melted and shaped for use in plastic applications or extruded as fiber for use in the textile industry. Nylon polymer is a high performance material used in plastic and fiber applications that require durability and heat-resistance. Nylon 6 has a high tensile strength, as well as elasticity and lustre. It is highly resistant to both abrasion and chemicals, like acids and alkalis. Nylon 6 is used in a broad range of products requiring high-strength materials. It is widely used for the automotive industry and for power tools housings. It is used as thread in bristles for toothbrushes, surgical sutures, and strings for musical instruments. It is also used in the manufacture of a large variety of threads, ropes, filaments, nets and tire cords, as well as hosiery and knitted garments. Gun frames can also be made with a composite of Nylon 6 and other polymers. Nylon 6,6 is preferred in many applications due to its exceptional tensile strength, elasticity, dye-fastness and a high melting point. Nylon 66 is used when high mechanical strength, rigidity and good stability under heat and/or chemical resistance are required. It is used in fibers for textiles, carpets and molded parts. Nylon 66 is also used in a multitude of auto applications such as radiator end tanks, rocker covers, air intake manifolds, oil pans and numerous other structural parts. Other uses include machine parts, conveyor belts, polymer framed weapons and the outer layer of turnout gear. The equipment we use is custom-built to process nylon, helping our products to run more efficiently in compounding. Our state-of-the-art color feeder allows us to add pigment that results in the black pellets that some of our customers need. We guarantee prompt, efficient and cost-effective shipping.